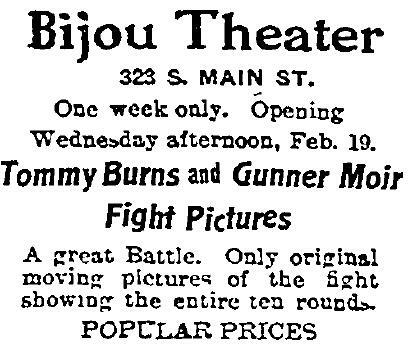 On February 19, 1908, the Bijou Theater at 323 S. Main St. showed the film of the heavyweight title bout between Canadian-born Tommy Burns and Gunner Moir, which took place in London December 2, 1907. Spoiler alert: Burns won. Los Angeles may have been especially interested in this fight, as it had witnessed live the bout in which Burns won the title from Marvin Hart on February 23, 1906. 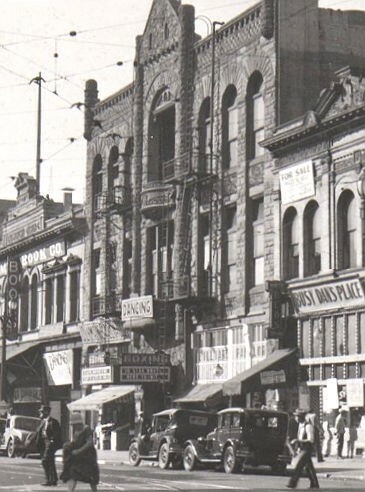 In 1926 the Bijou, located upstairs in the old Richardsonian Romanesque Turnverein Hall, was converted for use as a fight gym, Main Street Gym, aka Newsboy Gym, as seen in this detail of a larger photo (note the “boxing” marquee) Fight films continued to be shown in a café on the ground floor. On August 3, 1909, the Walker Theater at 730 S. Grand Ave. was showing the film of the July 5, 1909 middleweight title match between current World Champion Stanley Ketchel and challenger Billy Papke. It was the fourth contest between the two men. Papke had challenged Ketchel for the title on June 4, 1908 and lost. In a second challenge, held at LA’s Vernon Arena on September 8, 1908 and refereed by retired heavyweight champion Jim Jeffries, Papke pulled an upset and won. His claim to the title was brief, however. Ketchel took it back from him on November 26, 1908. 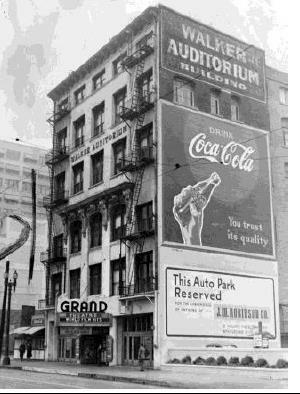 The Walker Theater in its later years when it was known as The Grand. The building was demolished in 1946. There would be no rematch between the two, however. Ketchel, who weighted around 170, had his sights on the heavyweight title, and met the 205lb reigning World Champion, Jack Johnson, on October 16, 1909. Johnson had won the title from Tommy Burns 10 months earlier, on December 26, 1908, becoming the first African American world heavyweight boxing champion. Ketchel lost the challenge, with a savage KO from Johnson in the twelfth round . There was already speculation about Jim Jeffries coming out of retirement to challenge Johnson. Jeffries, who’d trained as an amateur at the Los Angeles Athletic Club, had won the world heavyweight title on June 9, 1899 and retired undefeated in May 1905. The prospective match with Johnson was seeped in overt racism, Jeffries touted as “the Great White Hope” to reclaim the title on behalf of white America. The date was finally settled for July 4, 1910 in Reno, Nevada, dubbed “The Fight of the Century” by the P.T. Barnum-like promoter Tex Rickard. Johnson won easily and retained his title until losing it to Jess Willard on April 5, 1915. It was reported that Johnson’s victory over Jefferies sparked what would today be appropriately known as hate crimes in some parts of the country, and subsequently a number of cities banned exhibition of the films of the fight, ostensibly for fear of sparking “race riots.” The Christian Endeavor Society exploited the opportunity, launching a campaign to boycott showings of all fight films and denouncing the evil of motion pictures in general. 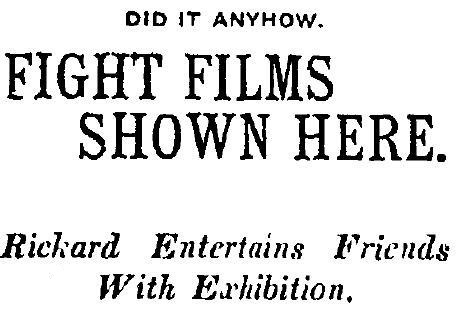 The films weren’t shown publicly in the city of Los Angeles but Tex Rickard gave a private exhibition on August 8, 1910 at the Clune Film Exchange offices, 727 S. Main St. 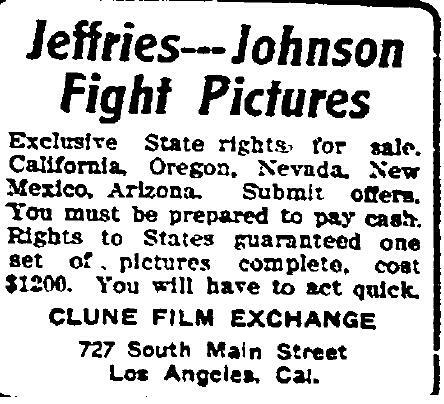 The Clune Film Exchange was offering exclusive rights to the Johnson-Jeffries fight picture for $1200. The town of Arcadia screened the fight film for the public on August 20, 1910. No ladies fainted and no riots broke out afterward. On July 31, 1912, a federal statute banning the importation and interstate transportation of prize-fight pictures went into effect. The punishment was a fine of $1000 and up to a year in jail. The first confiscation of such films on record occurred in California on September 18, 1912, when a theater promoter arrived by ship in San Francisco from Japan with films of the Jeffries-Johnson fight in his baggage. Willard-Johnson fight films banned in the US. 7/20/1915. When Jack Johnson unsuccessfully defended his title against Jess Willard in Havana, Cuba on April 5, 1915, the 1912 law thwarted efforts to bring films of the bout into the US. One print was confiscated from a Philadelphia promotor by customs officials at Newark; the promotor sued, challenging the constitutionality of the law, but lost. The case was upheld in the US Court of Appeals in July 1915. The following year, the manager of Madison Square Garden in New York and others were indicted for conspiring to bring the Willard-Johnson fight films into the country. As a result, few Americans got to see the fight, in which the champion was knocked out by Willard in round 26 . If you could manage to get hold of a print, however, it wasn’t expressly illegal under the federal law for theaters to show the films, although this could be challenged. Some cities went further and adopted local ordinances banning exhibition of fight films, but Los Angeles did not. The film of the July 2, 1921 fight between heavyweight champion Jack Dempsey (who beat Willard in 1919) and French boxer Georges Carpentier, at Atlantic City (again promoted by Rickard as the “Fight of the Century”) made it to Los Angeles by late September, where it enjoyed a public run at Miller’s Theater, 842 S. Main St. However, that same month, former Nevada governor Denver S. Dickerson was indicted by a federal grand jury for violating the interstate commerce regulations, accused of having smuggled the fight film into California. He ultimately paid the $1000 fine. The film was said to have been exhibited in 22 to 25 states and made a profit of some $135,000. 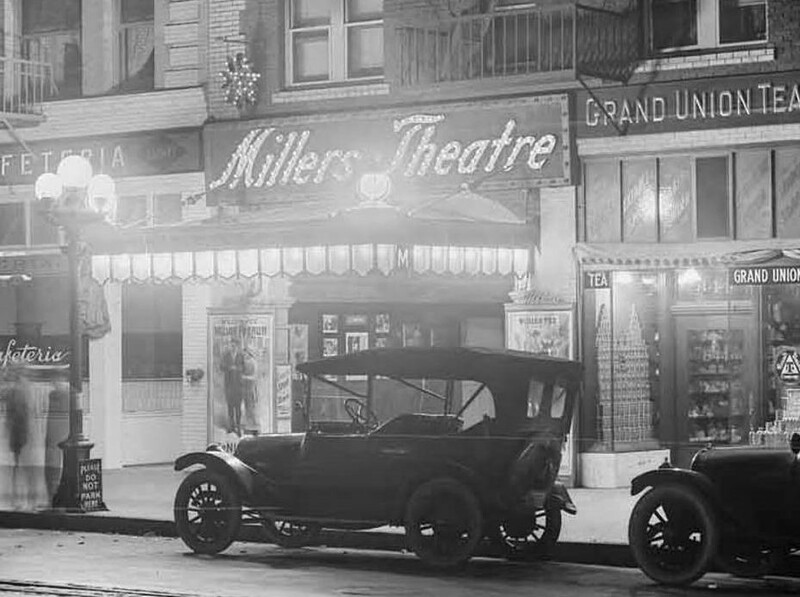 Miller’s Theater, 842 s. Main St. 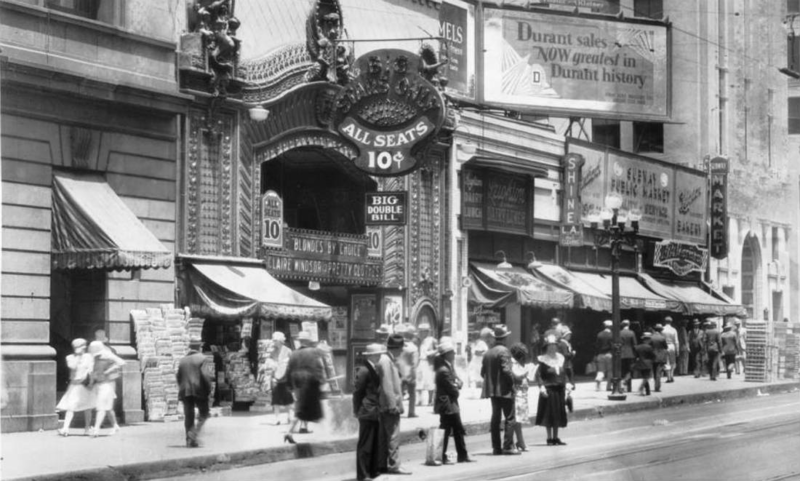 In late January 1924, the Pantages Theater at Seventh and Hill streets downtown exhibited the September 14, 1923 heavyweight title fight between Dempsey and Latin American boxer Luis Firpo that had taken place at the Polo Grounds in New York City. 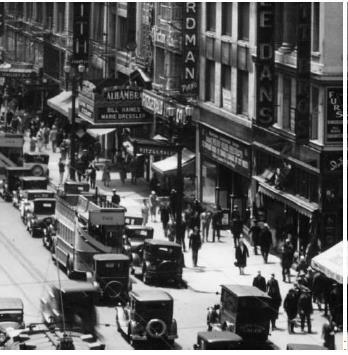 A few days later, on February 5, 1924, theater owner Alexander Pantages and a handful of others were arrested by federal agents on charges of conspiring to violate the interstate ban. The following month, the 1921 Dempsy-Carpentier fight picture was swept up in one of the many scandals surrounding Harding cabinet officials. In this case it was Attorney General Harry Daughterty, who was subject of a special Senate Committee investigation. The first witnesses heard was Roxie Stinson, divorced wife of Daughterty’s late personal assistant Jess W. Smith, who had killed himself in July 1923. Stinson said Smith told her he had acted as a go-between for Daughterty and certain motion picture companies that wished to exhibit the Dempsy-Carpentier fight picture, brokering a deal whereby Daughterty would see to it that the exhibiters were not prosecuted. Political operative Gaston Means testified that indeed, he had collected protection money, some $50,000, on behalf of the films’ owners, and gave the cash to the now conveniently dead Smith. Tex Rickard testified that he had given certain individuals a 50 percent interest in the film on the understanding that they could “rush” a new law through Congress that would allow its legal transportation and exhibition. “But I think I got bunked,” Rickard stated, ever the showman . 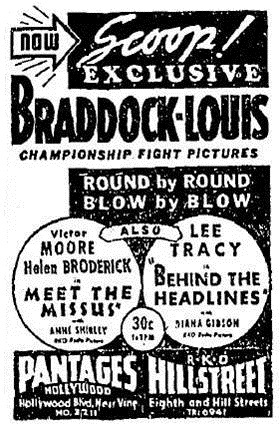 Protected or not, films of Tex Rickard-promoted fights continued to be widely shown in Los Angeles. 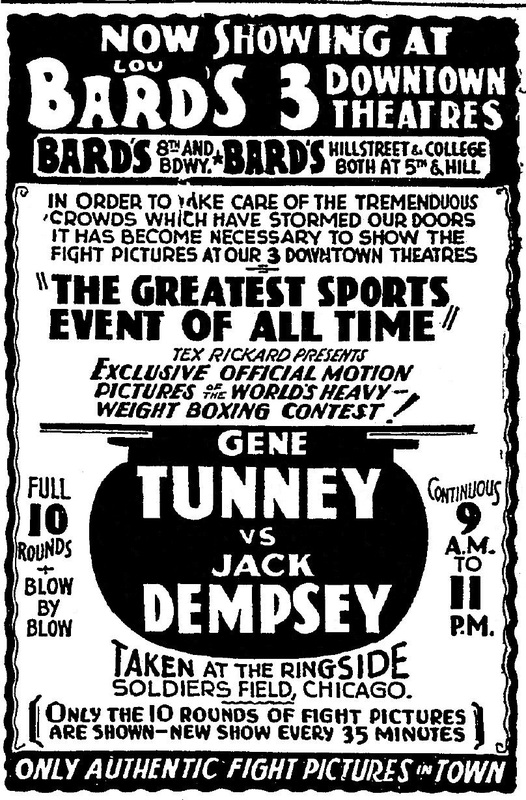 On July 7, 1927, the city’s new prime boxing venue, The Olympic Auditorium, premeired the films of the first Jack Dempsey-Gene Tunney fight of September 23, 1926 in Philadelphia, in which Dempsey lost the championship. The showings were held for 10 days, preempting the venue’s ususal Tuesday night fights. As Los Angeles Times sportswriters noted, “The Olympic is particularly adapted to showing fight pictures. The fans can smoke and cheer and razz like they were attending a regular fight.” The management estimated that in all 20,000 fans had attended, and the venue made more from the reel fight than real fights. The program was slated to continue over at the Philharmonic Auditorium for another ten days, but it was canceled due to protests from the Temple Baptist Church, which owned the building and still held services in the auditorium on Sundays. 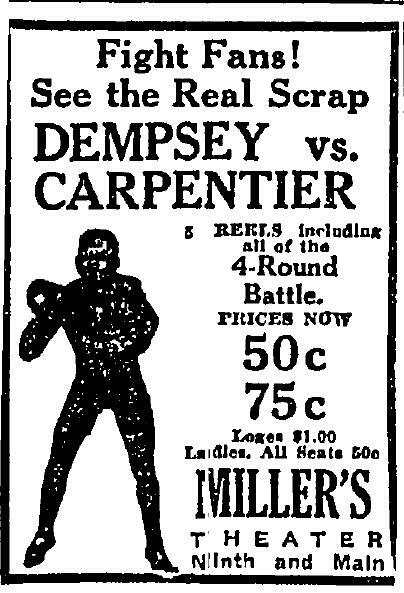 On August 11, Dempsey, a local resident at the time, had a private showing at his home of his June 14 bout against Jack Sharkey at Yankee Stadium. The next evening, August 12, The Olympic debuted that film for the public. The bill also included reruns of the September 14, 1923 Dempsey-Firpo fight and the July 24, 1923 battle between Lew Tendler and Benny Leonard. There were special midnight showings following the Tuesday night live boxing and the Wednesday night wrestling matches. 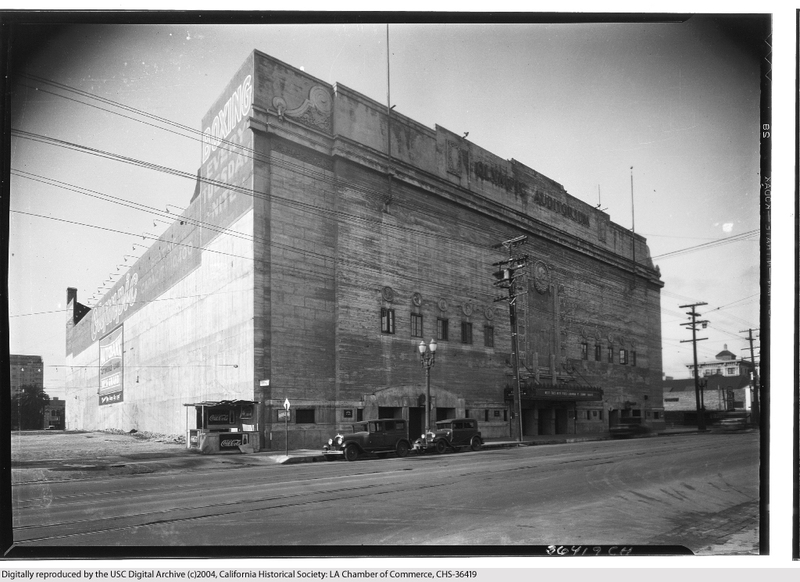 Olympic Auditorium, at 1901 S. Grand Avenue, in the 1920s. USC. 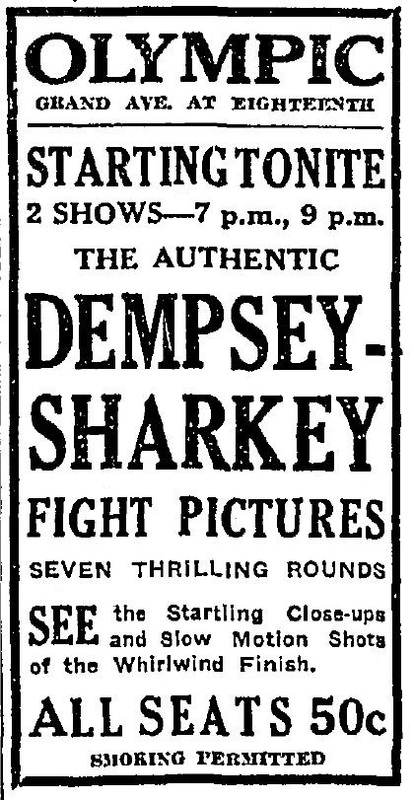 The match with Sharkey, which Dempsey won, was of particular interest due to Sharkey’s claim that he had been fouled in the 7th round. As he turned to the ref to protest, Dempsey knocked him out with a left hook to the jaw. Los Angeles, on viewing the film, concluded that the blows to Sharkey’s mid-section had been low, but not that low. 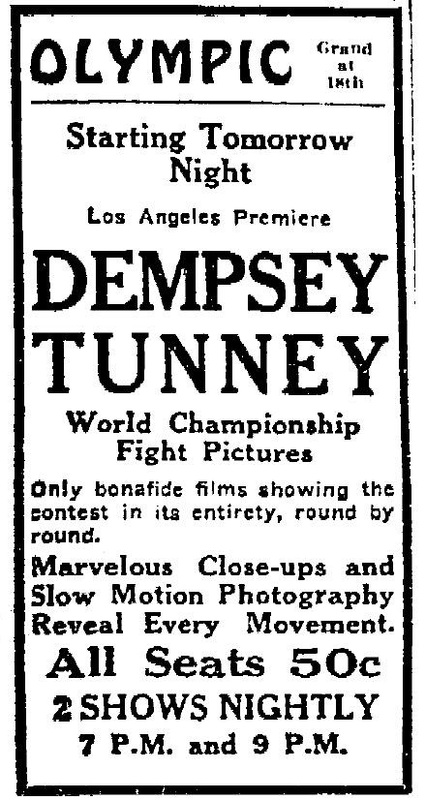 The fight film ban had perhaps its most notable challenge in September 1927 over the one millions of boxing fans across the country were especially anxious to see- the GONE WITH THE WIND of fight pictures- the Dempsey-Tunney heavyweight title rematch of September 22, 1927 at Soldier’s Field in Chicago. Everyone wanted to see the notorious “long count” with their own eyes. But the feds cracked down on efforts to distribute the film outside of Illinois, seizing copies of the prints from exhibitors. In Los Angeles, they met the plane carrying the cans of film at the airport and promptly confiscated them, to the disappointment of thousands of local fans. However, neither rain nor sleet, nor federal agents could keep Tex Rickard from making a buck. Somehow, he managed to get prints of it through the front lines, and they were showing at the Bard’s theaters downtown as of September 30, 1927, only a week after the fight. 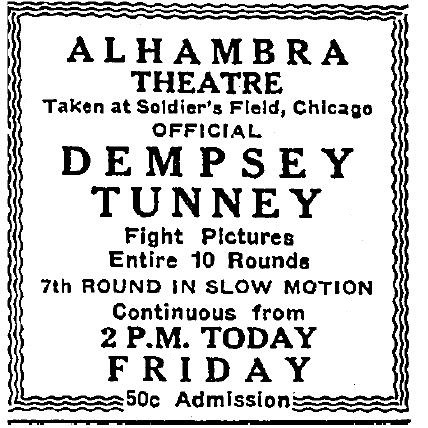 Such was the demand that the Dempsey-Tunney “long count” rematch was showing in three of Bard’s downtown theaters: Bard’s Hill Street at 444 S. Hill, Bard’s 8th Street at 313 W. 8th (later The Olympic Theater), and Bard’s College at 441 S. Hill. 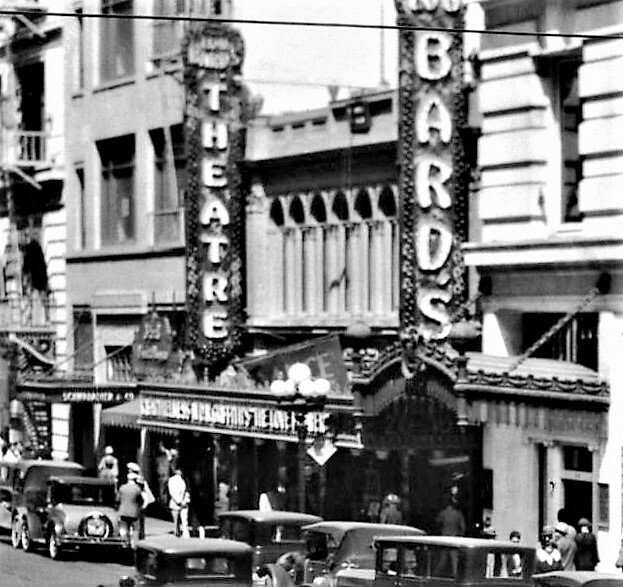 Bard’s Theater 8th Street in 1927. USC. Bard’s College Theater, 441 S. Hill St. 1928. USC. 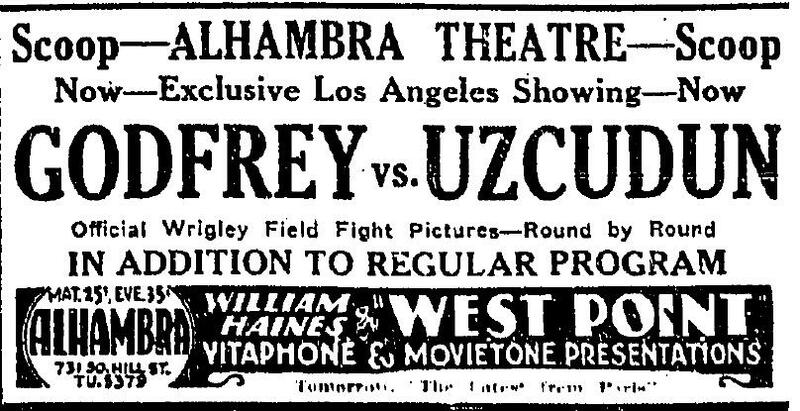 On March 1, 1928, The Alhambra was the exclusive exhibitor of the George Godfrey-Paolino Uzcudun fight film, but this would not have invoked the ban as the fight had taken place at Los Angeles’ own Wrigley Field on February 28. The Alhambra Theater, Los Angeles, 1931. Efforts to repeal the law were unsuccessful, but enforcement against exhibitors appears to have relaxed over time. The R.K.O. Hillstreet Theater at 8th & Hill and The Pantages on Hollywood Boulevard routinely screened all the big fights throughout the 1930s. 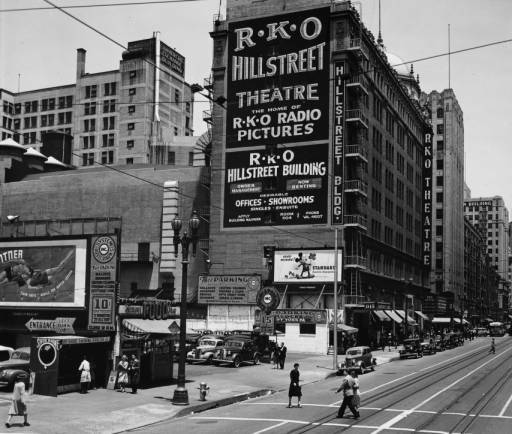 RKO Hillstreet Theater c. 1939. 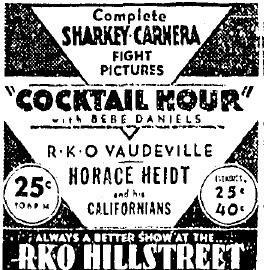 The lackluster Baer-Carnera heavyweight title fight of 6/14/1934 was at RKO Hillstreet by 6/18/1934. 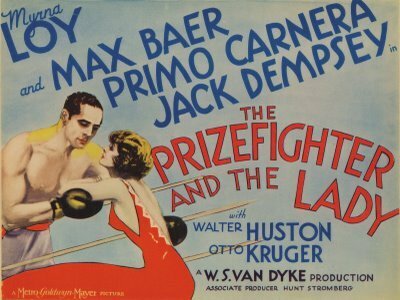 Reel life and real life blurred in The Prizefighter & The Lady depicting a preview of the fight between Baer and Carnera (with a different, yet just as prearranged, outcome). Flagging interest in heavyweight boxing revived in the latter half of the 1930s with the rise of the promising young contender for the title, Joe Louis. The match between Joe Louis and Max Schmeling in New York on June 18, 1936 was not so much a Jefferies-Jackson era battle of black vs. white as America vs. Hitler’s Germany, or democracy vs. fascism. Fortunately, it was indeed only a boxing match because this one was a rare loss for Louis. The films of the fight debuted at RKO Hillstreet and The Pantages on June 22, 1936. 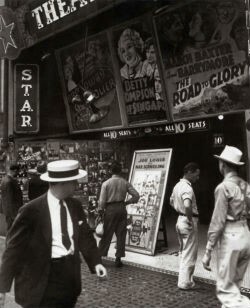 The Star Theater, a second-run house downtown at 529 S. Main Street showing the Louis-Schmeling fight film in the summer of 1936. Peter Swope photo. LAPL. Joe Louis of course went on to win the World Heavyweight Championship from Jim Braddock on June 22, 1937 at Chicago’s White Sox Park, the first black fighter to hold the title since John Jackson. 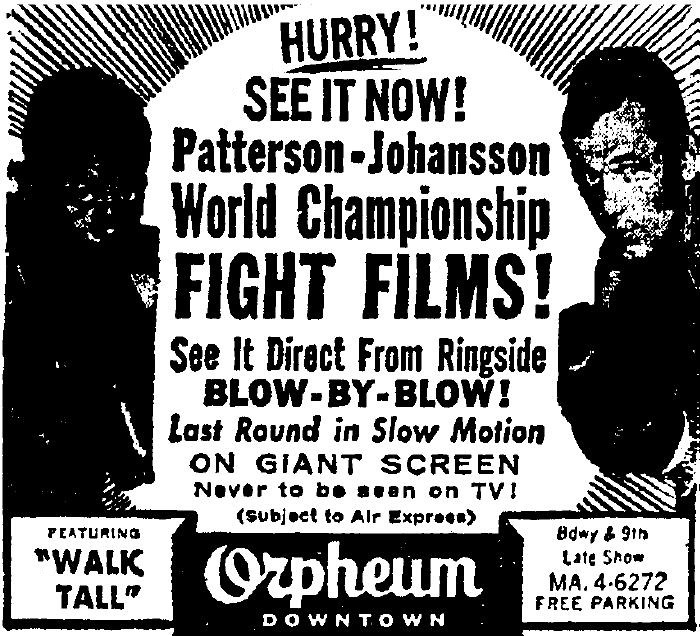 The film of the fight came to the good old RKO Hillstreet then moved to neighborhood theaters and second-run houses, where it played throughout the summer. 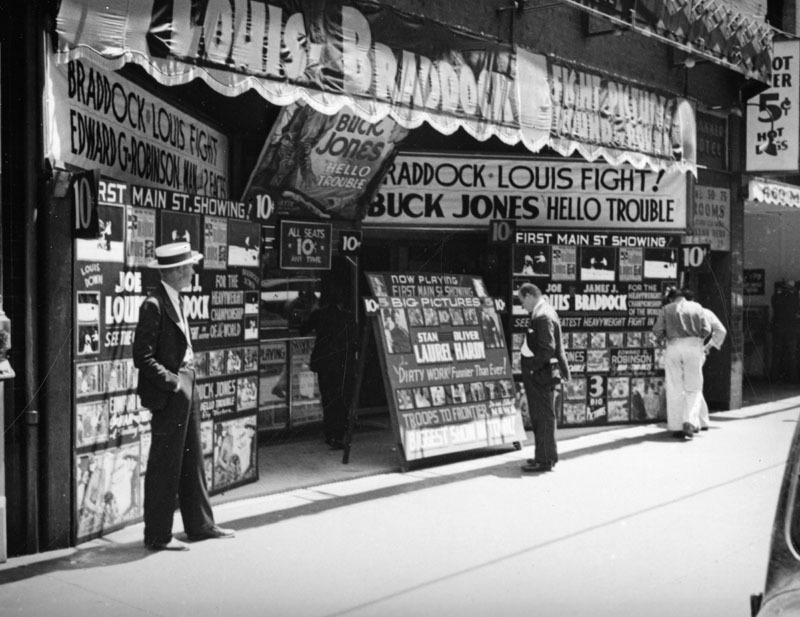 Braddock-Louis film at the Banner Theater, 456-458 Main Street, Los Angeles, c. summer 1937. LAPL. Louis’ skill in the boxing ring that won over white America, and his carefully crafted public image was designed to be the opposite of Jack Johnson. In any case, though Louis routinely pummelled a series of challengers- white, all (as black fighters then rarely got the chance at a title fight, even against a black champion)- no widespread race riots broke out. 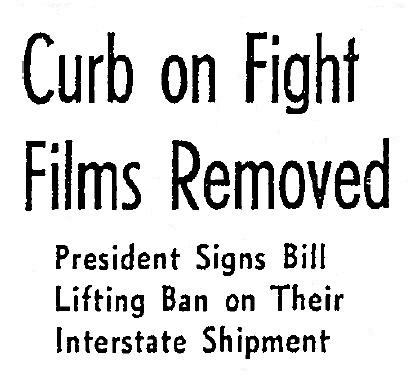 In 1939, Congress took steps to repeal the 1912 fight film ban. On May 29, 1939 former champ Jack Dempsy testified before the Senate Interstate Commerce Committee in favor of repeal. “I can’t see any reason of the present ban on fight pictures,” he said. The repeal was signed into law by President Franklin Roosevelt on July 1, 1940. After World War II, unimpeded by federal law, theatrically-released fight films flourished even as fight promotors worried that the rise of a new technology would cut into gate profits: television. 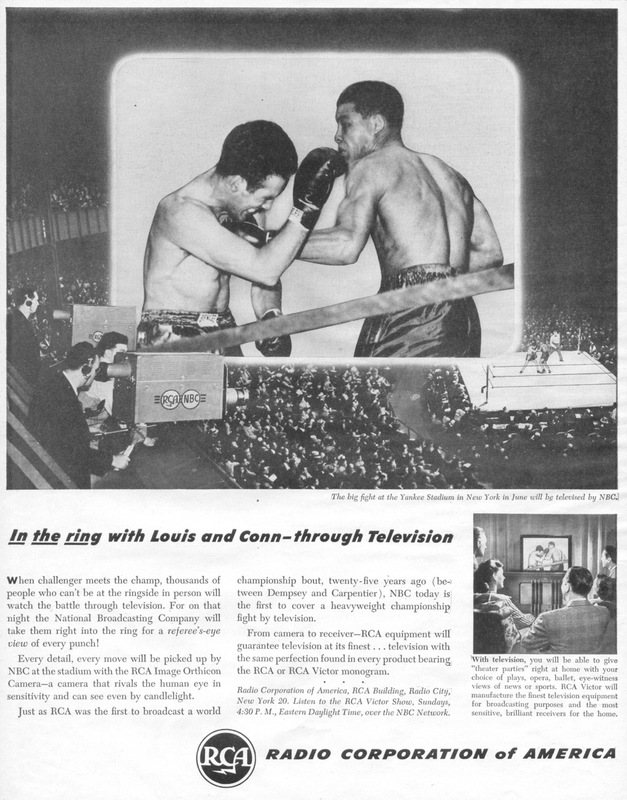 The highly-anticipated Louis-Conn rematch in 1946 was televised in a limited area. Most of the US had to go to a theater to see it. In 1921, RCA had pioneered the use of radio for fight broadcasts for the Dempsey-Carpentier bout; in 1946 it broke new ground in televising the Louis-Conn rematch in some parts of the country on N.B.C. Los Angeles could listen to the fight on the radio from local A.B.C. affiliate KECA. Los Angeles could see Louis-Conn on the big screen as of 6/21/1946. Alternatively, fans could buy prints of fight films from Castle Films at 1529 Vine Street and stage their own fight nights. 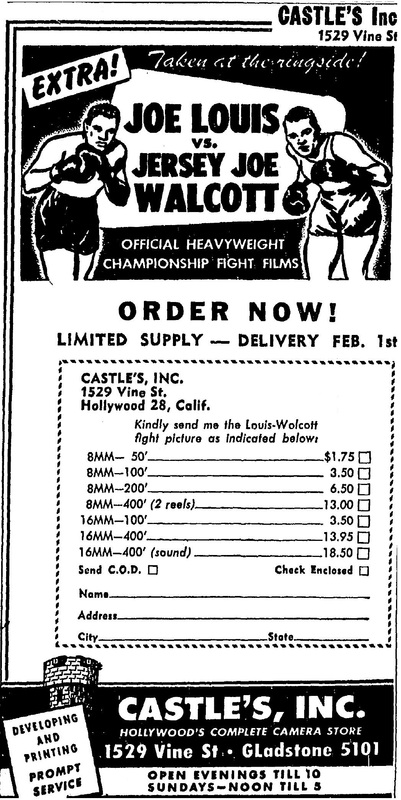 Below, Castle advertises a film of the controvercial Joe Lewis-Joe Walcott bout of December 5, 1947, which appeared at the Pantages and Hillstreet theaters on December 10. Meanwhile, the old fight pictures found a new home on the small screen, as part of NBC’s, ”Greatest Fights of the Century,” which aired from 1948 to 1954. 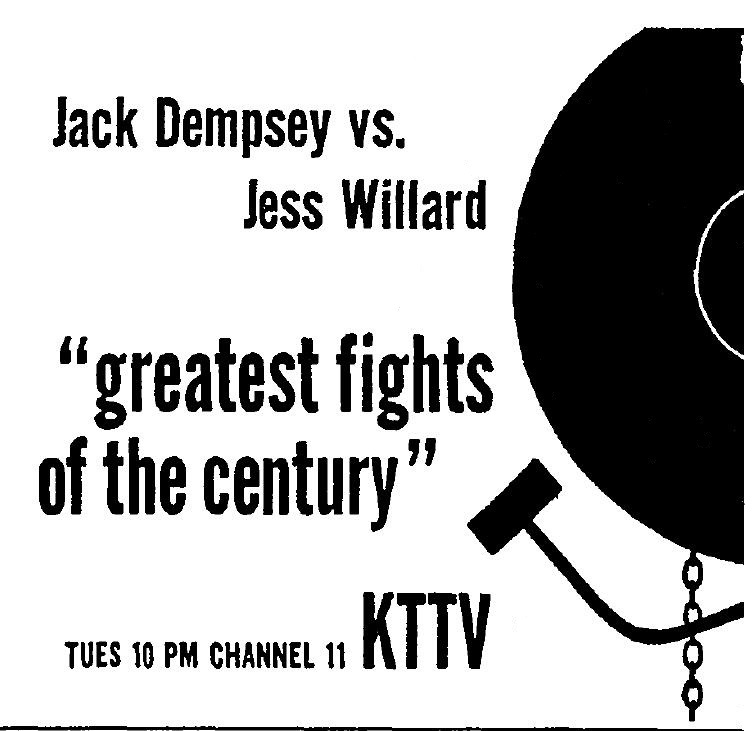 The 1919 Dempsey-Willard title fight aired on Channel 11, KTTV in June 1951 on a segment of Greatest Fights of the Century. 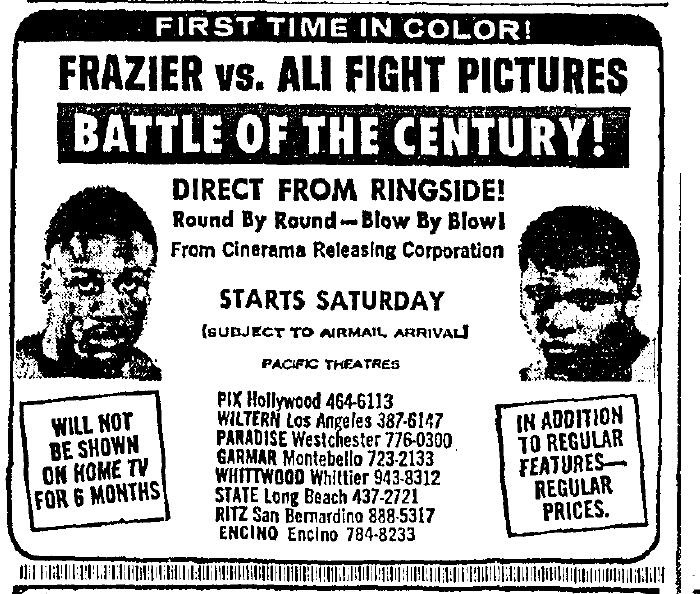 Fight films remained popular on the big screen into the 1970s, in part because the really big, important fights would not be televised for months, if ever. It was only after the rise of pay-per-view that theatrically-released fight films had their final fade out. The rematch between “Sugar” Ray Robinson and English boxer Randy Turpin for the world middleweight championship took place at the Polo Grounds in New York on September 12, 1951. Robinson, who had lost the title to Turpin two months earlier, won it back. Los Angeles audiences could see it for themselves at the Pantages and Hillstreet theaters by September 14, along with a double feature of Pickup and Criminal Lawyer. Never to be seen on TV! World Heavyweight champion Floyd Patterson and Swedish boxer Ingeman “Ingo” Johansson fought for the third time on March 13, 1961 in Miami Beach. Johansson had won the title from Patterson in 1959. Patterson recovered in in a rematch the following year and successfully defended it in this, their third meeting. In fact, it was televised to a limited number of local households. LA audiences could see it on the Giant Screen at the Orpheum Theater (subject to Air Express) as of March 15. Sports Illustrated called the first fight between Sonny Liston, who won the Heavyweight title from Patterson in 1962, and underdog Muhammad Ali (then still Cassius Clay) at Miami Beach on February 29, 1964 the “fourth greatest sports moment of the twentieth century.” Clay won by a technical KO. By now, films were more widely distributed, enjoying first-run releases in neighborhood theaters. “Will not be shown on home TV for 6 months.” The Muhommad Ali- Joe Frazier fight was billed as another “Fight of the Century.” This one took place at Madison Square Garden on March 8. 1971. Frazier won. The (color!) film of the fight was due to reach LA theaters on March 13 (subject to airmail arrival). 1. Stanley Ketchel was murdered on October 15, 1910 while training for a potential comeback. He was 24. 2. Johnson, later claimed that he had thrown the fight to Willard in the 26th round. He died in a car crash in 1946 at the age of 68. Willard, who settled in Los Angeles after his retirement, denied there had been any fix, and searched for a copy of the film of the fight for many years, finally locating a copy in Australia in 1959, thought to have been Johnson’s own copy. However, the print ended up in the hands of television producer Bill Cayton and Jimmy Jacobs, a local collector. The 1915 match aired on television the same year, but the critical 26th round had been cut out. Willard sued; the case was later settled. The footage showing Willard’s impressive and legit KO was later restored and featured in the documentary The Legendary Champions produced by Jacobs, Cayton and others in 1968. Willard died the same year at age 86. 3. Daugherty was forced to resign on March 28, 1924.